Your underwater metropolis awaits! Relax after a busy day by creating a colorful, soothing aquarium with this exciting and easy-to-learn game. A twist on classic tile-swapping games, with a hint of sim thrown in, the object is to match three or more fish to make them disappear. Clear the level before time runs out and earn cash to buy exotic fish and unique artifacts for your virtual fish tank. 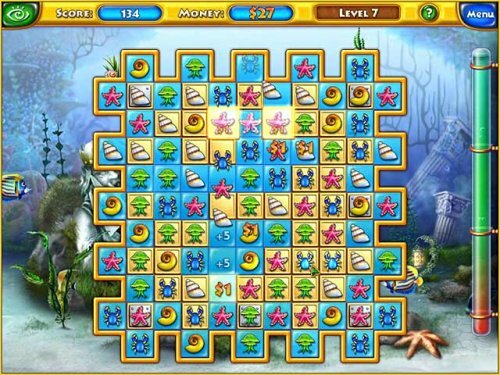 There are several levels to complete, 3 different backgrounds, and hundreds of fish, artifacts, and upgrades to unlock. Everything you buy can be used to design a spectacular virtual aquarium of your dreams, which doubles as your screensaver. this game is a blast....you make your own aquariam and they have 3 different ones ..
Nice Game,grt graphic's..and a screensaver to boot! I found this game too addictive, swimming through over seventy levels during my two week holiday recently, enjoying creating each unique fish tank as it was unlocked and then using it as a screensaver, love it, love it, love it!